MAH Re-CREATE 2015 will take place from November 5 to 8. The Emerging Researchers’ Symposium will take place on November 4. Activities will take place in two venues, which are in close proximity of each other, downtown Montreal. To walk from UQAM’s Coeur des sciences to Concordia’s EV Building takes approximately 20 to 25 minutes along De Maisonneuve Boulevard or Sherbrooke Street. Taxi cabs are available by calling or by hailing on the side of the road. Diamond Taxi 514-273-6331. Taxi Diamond App is available both for Android and iOS. Both locations are located on the green metro line, just 3 stops apart. Coeur des Sciences is at Place-des-Arts metro stop (NOT Berri-UQAM stop). Concordia University is at the Guy-Concordia Metro. Tickets can be purchased using cash, credit or debit cards at the fare vending machine or a ticket booth attendant. They are valid for both metro and bus. The 24 bus runs East – West along Sherbrooke Street. It stops in front of the Museum of Fine Arts, McCord Museum of Canadian History and just up the street from Concordia University – Hall building and EV building, and stops near to UQAM’s Coeur des sciences. Ticket options include (regular fare) – For more info. The Montréal airport is the International Airport Pierre-Elliot Trudeau (YUL). The airport is situated approximately 20km from the venues of Re-Create 2015, which are located in downtown Montréal. Delegates are responsible to make all necessary arrangements to enter Canada. Ensure you have a valid passport at all times, and in some cases, a visa is necessary. For more information visit Citizenship and Immigration Canada. The 747 bus line service runs 24 hours a day, 7 days a week, between the Montréal-Trudeau airport and the downtown terminal : Gare d’autocars de Montréal terminal (Berri-UQAM métro station). 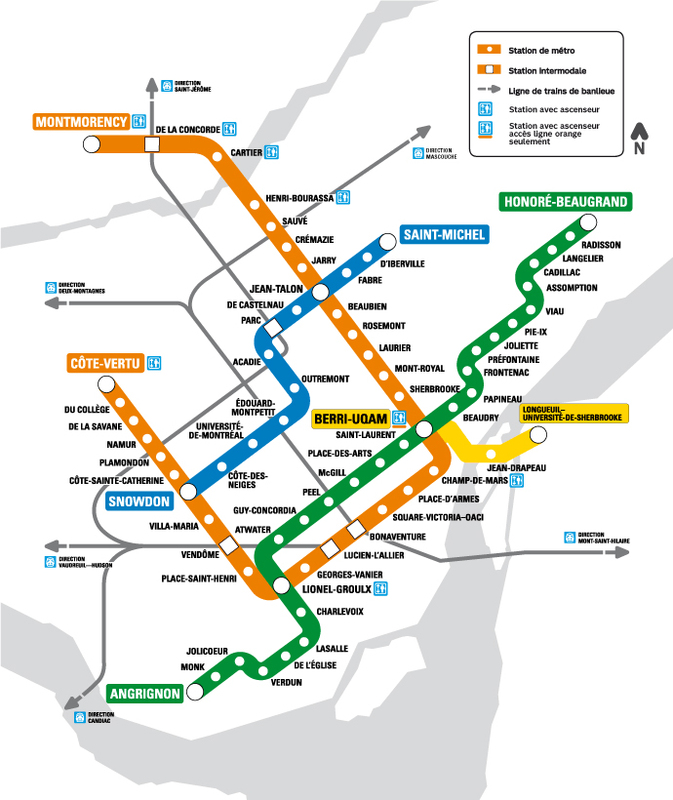 The fare is 10$ and offers unlimited travel throughout STM bus and métro networks during 24 consecutive hours. A taxi from the airport to downtown is $40 fixed fare. CC are usually accepted. Ask your driver before starting your ride. Weather in Montreal can vary daily and is usually between 0 and 10 degrees celsius in early November. It might rain but usually doesn’t snow until later in the month. Most people carry a jacket and layer their clothing in the Fall. 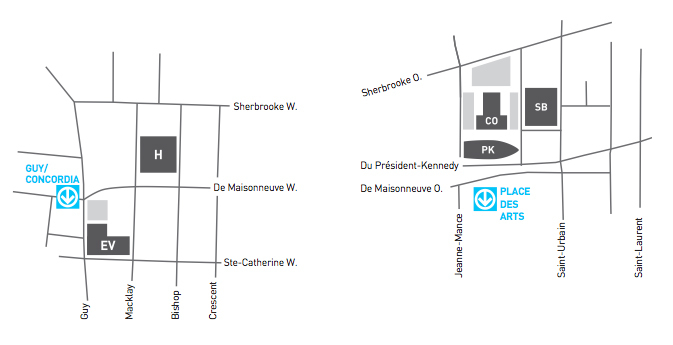 Both MAH venues are centrally located in downtown Montreal, with options for all budgets in close proximity. Meals are not offered at the conference venues. Throughout the event, coffee, tea as well as light snacks will be offered at the Chaufferie in the morning and afternoon. Finger-foods will be served at the Opening reception of November 5th. Taxes will be added to your bill (15%) at local restaurants and cafés. Tipping between 15 – 18% is excluded from the total. Snug spot whipping up crêpes for breakfast, lunch & dessert as well as smoothies, waffles & gelato. sandwichs, soups, salads, to stay or to go. Open 11:30am – 9:30pm Tuesday to Friday, closed between 2pm and 5pm. Saturday 4:30pm – 9:30pm. Open 11:30am – 11pm Monday to Friday, closed between 2pm and 5pm. Saturday 5pm – 11pm. Open 11am-11pm Monday to Friday. Saturday 10am – midnight. Sunday 10am-11pm. Many other restaurants in the area. Websites such as yelp.ca or urbanspoon.ca have ratings and reviews of local restaurants with descriptions and sometimes full menus. * Your MAH Re-Create 2015 registration ticket grants you free entrance to the Canadian Centre for Architecture (CCA). There are regular 60-minute exhibition tours, from Wednesday to Sunday, at 2:00 pm in English and 3:30 pm in French.